The votes are in! First place viewers' choice was awarded to Rachelle Denneny for Royal Amethyst and second place was awarded to Mineko Kikuchi for Anenome. 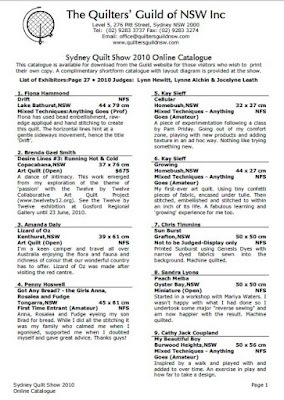 Sydney Quilt Show 2010 prize winners list (PDF 22KB). Kidskills: 10am and 1pm, a free activity aimed at introducing children to the delights of colour, fabric and block designs. 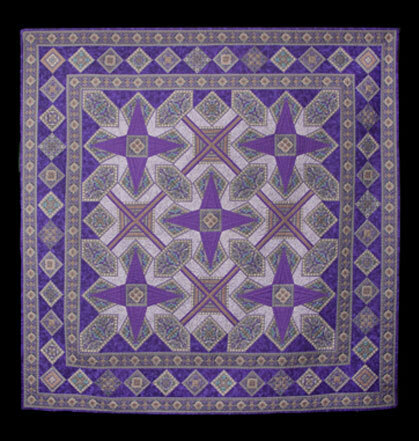 In addition, at 3pm, Sunday 20 June 2010, you are invited to join Dr Dianne Firth, exhibition curator for a floor talk about the exhibition and the selection process for The New Quilt 2010 Contemporary Quilt Textiles at Manly Art Gallery & Museum, the Esplanade, Manly. The New Quilt 2010 is an exhibition of contemporary Australian quilt textiles presented by The Quilters' Guild of NSW Inc in partnership with Manly Art Gallery & Museum. 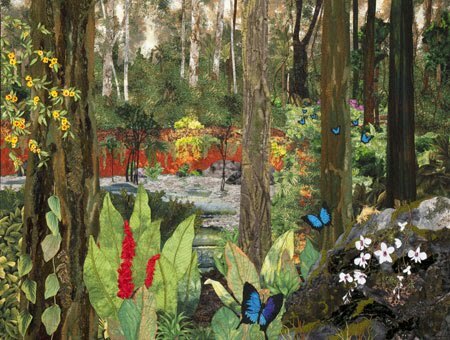 The exhibition will be launched officially on Friday 18 June at 6pm by its curator, leading textile artist and art academic Dr Dianne Firth, Associate Professor & Head of Landscape Architecture in the Faculty of Art and Design at the University of Canberra. See Public Programs for further details about accompanying events and programming associated with this exhibition. A colour catalogue, sponsored by Brother International Australia, is available from the Gallery or the Guild office for $4.00 or you are welcome to download any of the following documents. s part of the awards ceremony we remembered the late Narelle Grieve (1939-2009). Not only has her contribution to the quilting community been recognised with the Narelle Grieve Award for Amateur Hand Quilting which was won by Shirley Merriel, but Narelle's own quilt Legacy won the Retaining the Tradition Award sponsored by Australian Patchwork & Quilting. Narelle completed the magnificent appliqué and hand quilted around each appliqué design before her sudden illness. The background and border quilted by Maree Gebhardt. 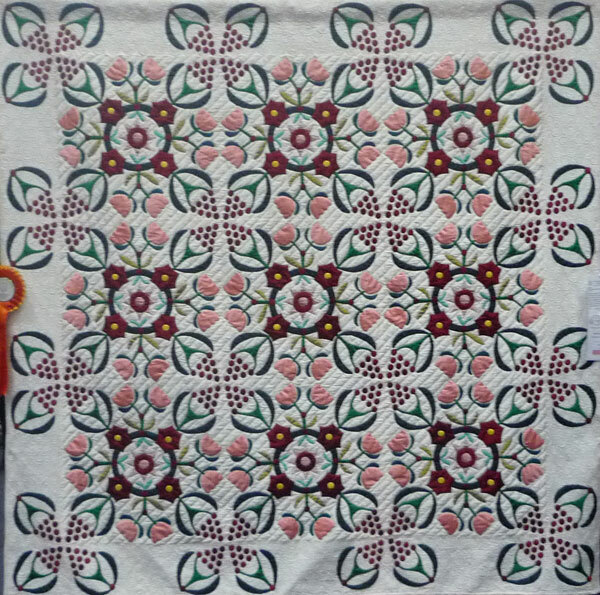 Original design inspired by an antique quilt. 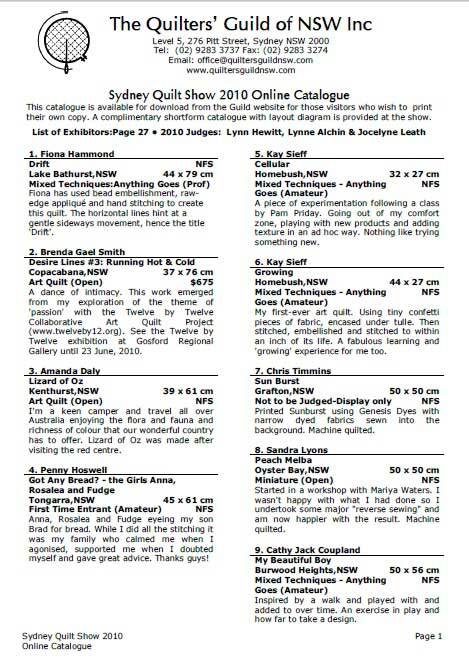 Download the Sydney Quilt Show 2010 prize winners list (PDF 22KB). Kay remarks: There is a magic in the sun-dappled Australian Rainforest. Life is abundant, things fluttering, buzzing, rustling, croaking, warbling, rippling and whispering just out of sight. Yet there is a stillness... A suspension of events until you look away. 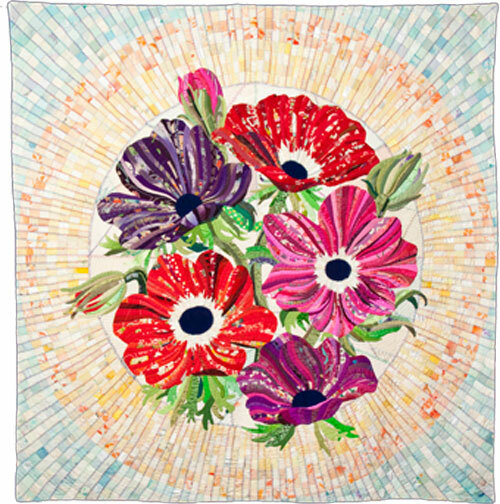 As it happens, Kay is also one of the guest exhibitors at Sydney Quilt Show 2010. She will be presenting daily floor talks reviewing a selection of her works at 10am and 2pm. Come along and learn more about how Kay creates her wonderful quilts. Photography Policy: Please respect the copyright of our members. You are welcome to take photos of quilts in the Guild area for personal use only but please do not publish any images online or in other media unless you have obtained the consent of the relevant quiltmaker. If you wish to publish images from the show for commercial purposes, you must obtain the prior consent of the Guild. The New Quilt 2010 opens at 10am on Friday 18 June (with an official opening event from 6-8pm) and continues until Sunday, 25 July 2010. The gallery is open Tuesday -Sunday (10am-5pm) and offers an comprehensive program of activities including a curatorial floor talk by Dr Dianne Firth at 3pm, Sunday 20 June 2010. Machine appliqued, pieced and hand quilted. Image courtesy the artist. Art to Wear 2010: Classic Oz Rocks! 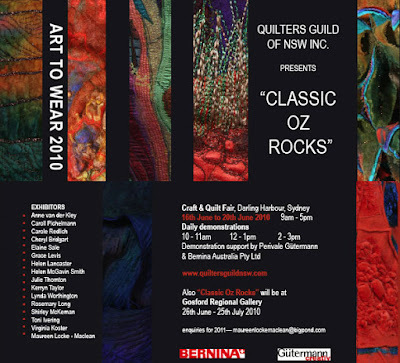 As part of the annual members' exhibition, The Quilters Guild of NSW is proud to present Classic Oz Rocks! extraordinary garments in a palette of ochre (70%), teal (15%), indigo (10%) and the artist's choice of colour (5%). Featured artists are: Anne van der Kley, Carroll Pichelmann, Carole Redlich, Cheryl Bridgart, Elaine Sale, Grace Levis, Helen Lancaster, Helen McGavin Smith, Julie Thornton, Kerryn Taylor, Lynda Worthington, Rosemary Long, Shirley McKernan, Toni Evering, Virginia Koster, and Maureen Locke-McLean. Following the quilt show, Classic Oz Rocks will be on exhibition at Gosford Regional Gallery from 26 June - 25 July 2010. Sydney Quilt Show - one week to go! 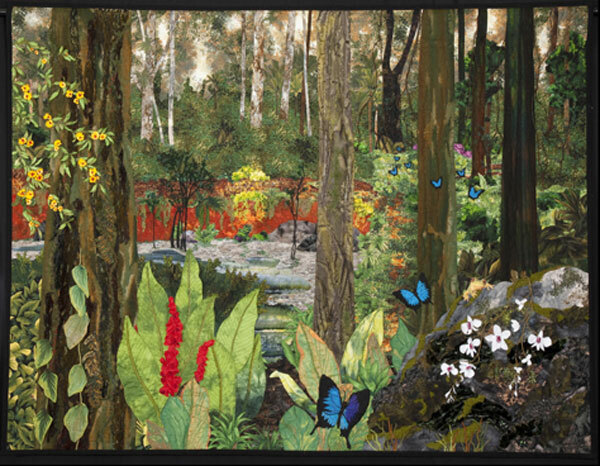 The Sydney Quilt Show is an annual members' exhibition presented by The Quilters' Guild of NSW Inc in conjunction with the Craft & Quilt Fair at the Sydney Exhibition Centre, Darling Harbour, Sydney. The doors open at 9am on Wednesday 16 June 2010 with an official opening and awards ceremony at 9.30am. Kidskills: Saturday 19 June 10am and 1pm and Sunday 20 July 10am and 1pm. The Sydney Quilt Show is a source of inspiration for many a would-be quiltmaker including children. The weekend "Kidskills" program is a free activity aimed at introducing children to the delights of colour, fabric and block designs. The quilt show will be open from 9am-5pm daily, 16-20 June 2010. The Guild welcomes all members and visitors. The Guild has secured a photographer to record images of the prize winning quilts as they are selected on judging day. However, we still require a photographer for the balance of approximately 200 quilts for the Guild's archive records. If you are available on set-up day, Tuesday 15 June and have the capacity to take reasonable (straight and square! 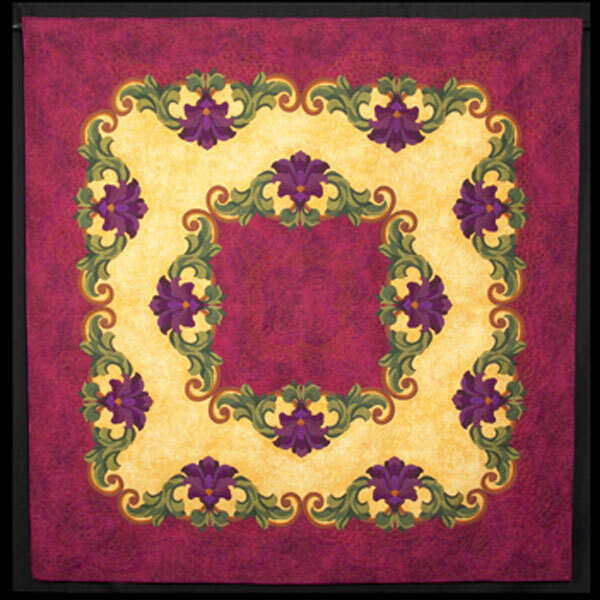 ), high resolution quilt images, please contact the Guild Webmaster. 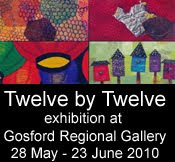 The exhibition of the Twelve by Twelve Collaborative Art Quilt Project continues at Gosford Regional Gallery until 23 June 2010. One of the Australian "Twelves", Brenda Gael Smith will be presenting an artist floor talk at the gallery this Saturday, 5 June at 2pm. Free admission - all welcome! take down (5.00-7.30pm Sunday, 20 June). We are especially looking for assistance with take down. If you are entering a quilt in this year's show, it's time to check that your quilt is correctly labelled with a hanging sleeve/velcro strip (as applicable) and to make contact with your "Drop Off Lady" regarding delivery of your quilt. Quilts must be delivered to Drop Off Ladies by Wednesday, 9 June. Finally, this week is your last chance to purchase tickets for the Gala Dinner with guest speaker Jocelyne Leath. Don't miss out!